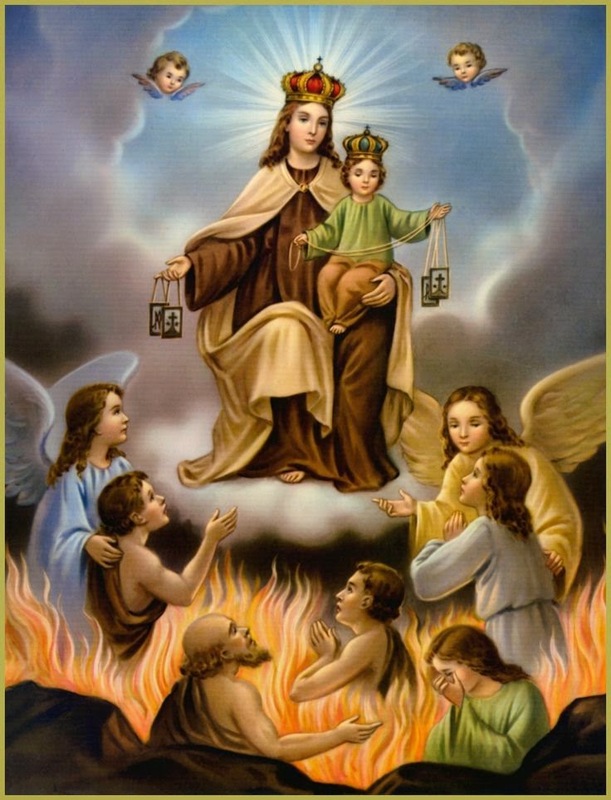 Et Verbum: The Condition of the Suffering souls in Purgatory, by Rev. John A. Nageleisen. On the Means of Relieving the Suffering Souls. Part 28. The Condition of the Suffering souls in Purgatory, by Rev. John A. Nageleisen. On the Means of Relieving the Suffering Souls. Part 28. § 43. The Fruits of Holy Mass are not Granted Exclusively to the Soul for whom the Sacrifice is Offered. 252. As we have seen, the main purpose and effect of Holy Mass is to render to God the worship of adoration and thanksgiving, of propitiation and impetration, that mankind owes to Him; at the same time one of its essential qualities is, that it can be offered up for man himself to promote his bodily and spiritual welfare. Among the many effects of Holy Mass there are graces, spiritual benefits and blessings, temporal gifts and bounties, which God grants us in consequence of the offering of this Sacrifice; all of which may in a real and full sense be called sacrificial fruits. To these fruits we refer as a rule when we say that the Sacrifice was offered for the benefit of someone. To offer the Sacrifice for someone may also mean that we offer it in somebody's name, or in place of some other person. As a Sacrifice of propitiation and impetration Holy Mass has for its special aim the profit and advantage of the person for whom it is offered ; for by its power of atonement and intercession it procures for him goods and benefits of all kinds. To these blessings we make reference when we speak of participating in the fruits of the Sacrifice. 253. Among the, partakers of these fruits we usually number the following: the whole Church, the sacrificing priest, all those for whom the priest offers the Sacrifice in a special manner, and finally the faithful assisting at Mass. The participation in the fruits of Holy Mass may therefore be fourfold: general, particular, mediate and special. Every time the Holy Sacrifice is offered it obtains its effect and profit for the whole Church, for all the members of the mystic body of Christ who are still in need of the help of grace, be they living or dead. Holy Mass is always the highest act of general homage offered to God by the whole Church. Our Divine Savior left it to her as His most precious legacy, to be her most fruitful source of grace, aid and consolation. 254. This general fruit of the Sacrifice is not granted to all the members of the Church in the same manner and degree. Those who take a more or less personal part in the sacrificial act and who are therefore in a certain sense co-ordinate ministers of its offering, without doubt receive more abundant blessings not only because of their co-operation in the act of offering, but also in virtue of the divine efficacy of the Sacrifice itself. While the whole Church shares in the general fruit of Mass, its particular fruit is granted to the ministering priest; for as it is he who takes the place of Christ and performs the Sacrifice in His name, it is obvious that a particular fruit should be granted to him. The mediate fruit is gained by those for whom the priest as the representative of Christ offers the Sacrifice in a special manner. It has always been customary in the Church to offer the Holy Sacrifice for the particular intentions of the faithful. Holy Mass is their secure haven of refuge in all their needs and distresses, and hence they have always been most solicitous that Holy Mass should be offered for them and for others in life and after death. Finally, those of the faithful who are present at the celebration of Mass are granted a special fruit. Among the various ways of participating in the celebration of the Holy Sacrifice, personal and actual presence at it deserves special mention. Those present in this wise have so much the greater share in its essential fruit, the greater their devotion and purity of heart; and this is their special fruit. 255. More meritorious than to be actually present at Mass is to contribute for the purpose of its celebration. As Holy Mass is an invaluable divine work, and as God is infinitely pleased with its celebration, it is self-evident that we perform a very good work and obtain .the richest graces, if we cause a Holy Mass to be celebrated for ourselves or for others, living or dead. By ordering it we are the cause of its celebration—and the result is, that the adorable Son of God is offered anew to His Heavenly Father; that He is as it were born again for the purpose of renewing this sublime mystery; that this most meritorious Sacrifice is offered up, whereby the Most Holy Trinity receives infinite glory; that the saints in heaven obtain ineffable joy, the Suffering Souls in Purgatory are granted refreshment and release, and all the faithful on earth are so to say flooded with grace and mercy. What gracious return will our Heavenly Father not make to us for causing such infinite joy to the whole celestial court? —Pious Christians who have the means will therefore have a Mass said from time to time for themselves and their families, for this or that intention; and others who have not the means will ask their friends among the priests for charity's sake to say a Mass for their intention. That they do well, no good Christian will dare to deny. 256. It is certain therefore that the giver of an alms for a Holy Mass acquires an ample store of merits by having such a great Sacrifice renewed through his own personal effort. To the Suffering Souls he can cede only that part of these merits which atones for temporal punishments. The greater his participation in the Holy Sacrifice, the more abundant fruit will he receive for himself or the Suffering Souls for whom he caused Mass to be celebrated. If he assists at the Mass which he ordered, his merit is increased ; he hastens to the fountain with a larger vessel to receive a more plentiful share of the special and essential fruit of the Sacrifice. And if he receives holy communion during the Mass, his share of merits will be much greater still. Hence there is in many churches a general monthly communion for the relief of the Suffering Souls during a High Mass ordered by the Poor Souls' Confraternity. Theologians consider the tree of life which stood in the midst of paradise, "bearing twelve fruits, yielding its fruit every month, and the leaves of the tree were for the healing of nations'' (Apoc. xxii. 2. ), as being a symbol of the Most Holy Eucharist. Now, if the Blessed Sacrament is symbolized by the fruits of this tree, it is obvious that this custom of monthly communion must be very praiseworthy and salutary. By Holy Mass and by the application of indulgences the Suffering Souls share not only in the satisfactions of individual persons, but also and in a special manner in the merits of Jesus Christ, procured for them by the agency of the Church, His most pure Spouse; and there can be no doubt that God accepts them. Nevertheless their acceptance is not an unconditional one, but is dependent on the inscrutable designs of His Providence, and perhaps also on the zeal which the deceased showed during life in making themselves worthy of this assistance. Yet they always receive great relief and refreshment as often as these spiritual treasures are gained for their benefit.